Yesterday I was enjoying a sleep at noon. Suddenly a postman rang the doorbell and delivered me a letter which was from my grandfather living in a far-off village. My younger brother saw the letter. He wanted to know how a letter reaches its destination. When I marked his eagerness, I decided to explain to him the whole procedure. I asked him to listen to me attentively and I began as follows. When we want to convey some message to our friends and relatives, we write a letter and drop it into a letter box. The time of clearance is written on each letter box or post box. The post boxes are cleared by the mail-peons at this time. There are a sufficient number of collection offices in each city for the quick dispatch of mail. The seal of the collection office is marked on it and the letters are sorted out destination wise. Separate bundles are prepared for separate destinations. If the number of letters is more than ten a slip with destination written on it is pasted on the bundles. If the number is less than that they are kept loose. These bundles and loose letters are kept in a bag. All these bags are sent to the Railway Mail Service office by a Mail Motor Van of red color. The Railway Mail Service office opens these mail bags. Loose letters are sorted out along with these letters collected from the Railway Mail Service post box. All the mail is arranged according to destination and then given to their Running section which works in a railway compartment attached to the trains. Loose unsorted letters are sorted in the Railway Mail Service compartment and are arranged destination wise. These bags of letter are handed over at their destinations to the Railway Mail Service staff. These letters are further sorted out zone wise and sent there. Seal is again marked on the letters at the delivery offices. At the zones letters are further sorted area wise. A postman is deputed for each area. The postman of the area receives the letters and delivers them to persons addressed. The postman of the Branch Post Office delivers them to the person concerned of the village. Each village receives its mail on the fixed day. Thus we see that post office renders us valuable service. 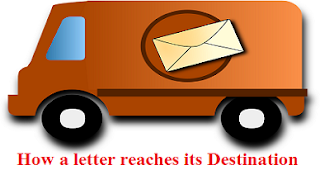 We should write full and clear address on our letters for their quick and sure delivery. Pin code number of the city should also be written on them.